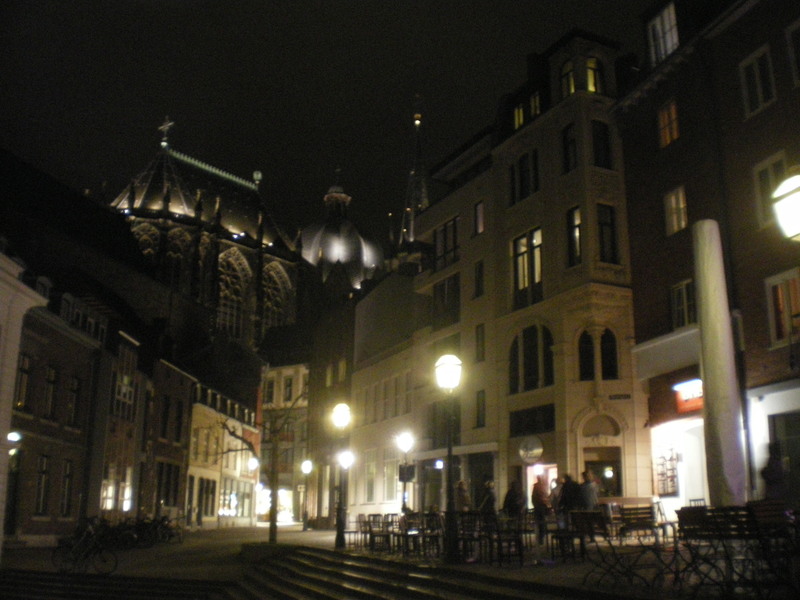 Friday 19th April – about Aachen. Words by Iain Dawson, photos by Ian Macsporran. 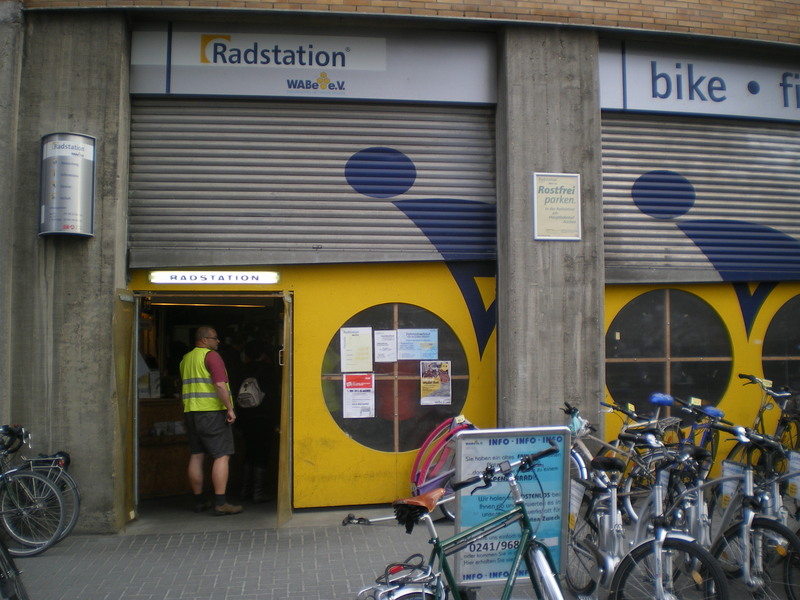 With David’s bottom bracket having spent the last few miles of Belgium protesting, Philip had agreed to hook him up with the best cycle mechanic in Aachen (thanks, Connie). Rowan had apparently spotted something called “shopping” and our hosts had to work for a living so Ian, Alex and I agreed to meet back at the Elisenbrunnen after breakfast and go for a ride. 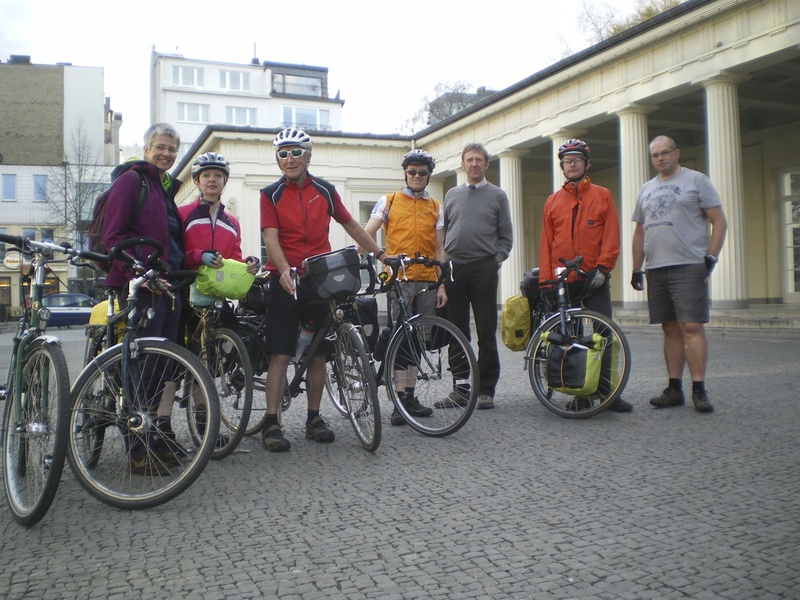 This wasn’t a planned part of the programme, so can’t be classed as an official CTC ride, but we were in Germany, we had our bikes, we were going to ride. I’d put this plan before our hosts that morning, explaining that we wanted to head east of the city, and was immediately asked “Why?”. Apparently, things are much prettier if you head due north and I can’t fault Elke’s logic on that. 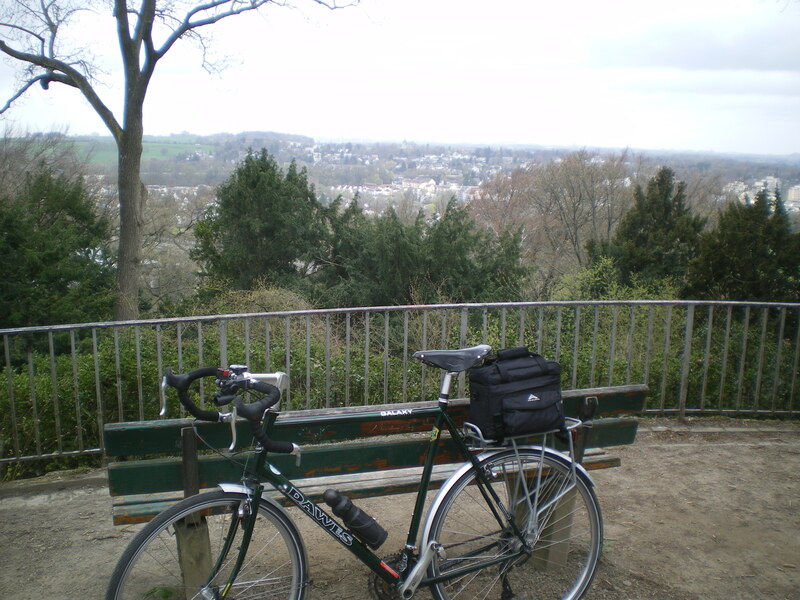 We rode over the Lousberg, which is as close as Aachen gets to a city park. 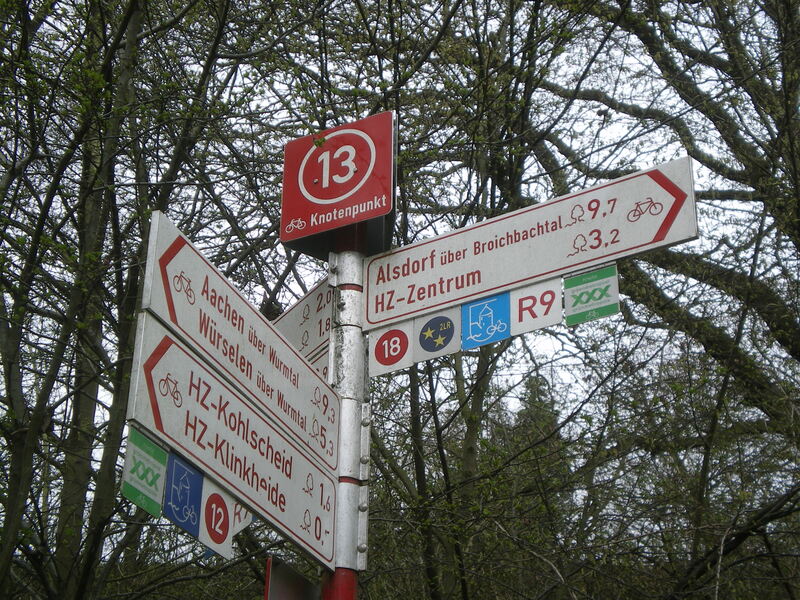 We then pedalled through the Wurmtal, a lovely little valley with a node network to assist in route-finding. We got to Elke’s proposed drink stop a litle before it opened so pressed on into the town of Herzogenrath. Not the prettiest place on the map but the coffee was perfectly decent and the cake remarkable. We took a slightly different route back out of Herzogenrath to pick-up directions back into town and found ourselves riding down a slightly unusual street. Unusual only in that the bus stop signs had changed (again) and the streetname was printed twice. Once in each of two languages. 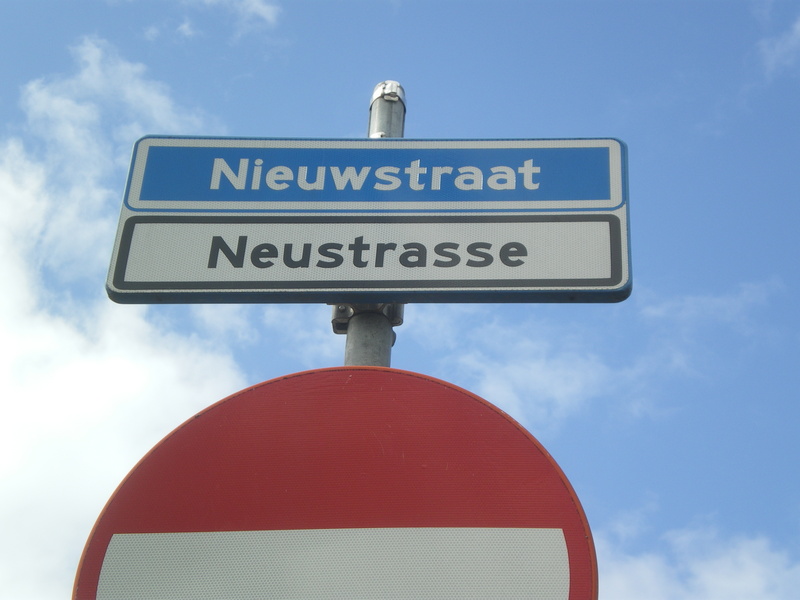 Niuewstraat, as it’s known on its northern side, or Neustraße as it’s known to the folks on its southern side, is indeed unusual. 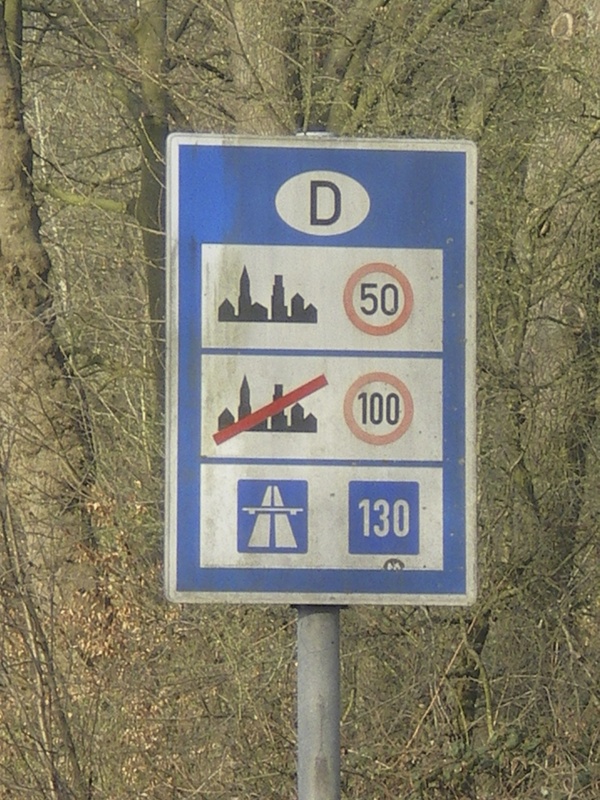 The border between the Netherlands and Germany runs right down the centre of the road. The Lidl supermarket is in Germany but to get to it, you have to navigate a roundabout which is half in the Netherlands. Apparently, when the two countries play each other on the football field, this is not the place to find yourself. It was perfectly peaceful while we were there though. So which country am I in? The Endomondo route of our morning ride is here – 23 miles. We picked-up our planned route back through Bank to Aachen central and stopped for a decent lunch before heading over to meet the others in the thermal baths. It turns out, to Ian’s great delight, that Aachen’s local contribution to the culinary world is black pudding, although our waitress was somewhat at a loss to understand why a cyclist would want to order alcohol-free beer. Don’t know why, everywhere seemed to sell it. Having fed, we belted across town, back on Alex’s GPS, to the Carolus Thermen – Aachen’s other main tourist draw – to touch base with the rest of the group. Connie had arranged a courtesy bike for David while his was in for repair so we were all still mobile! A sauna and swim-session later (so relaxing), the others had disappeared off for a bite to eat so the three of us regrouped and headed across to the main rail station (herinafter referred to as the Hbf) to meet up with Bob and Sue, and Ulrich, for a tour of Aachen’s cycle facilities. These involve a lot of the usual helpful stuff, like cycle lanes, but also some superb, secure, cycle parking at the station and, crucially, left turn lanes for cyclists at some of the busy junctions. 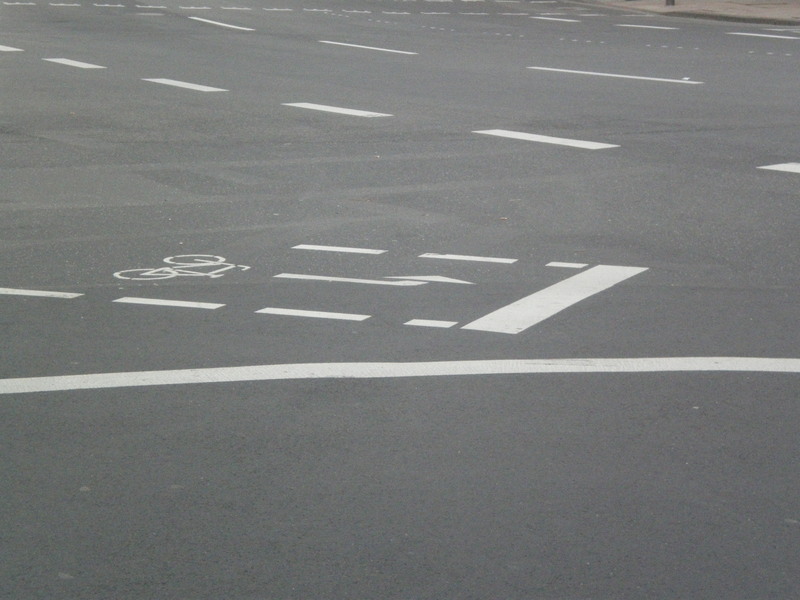 These allow a cyclist to come through the right-hand lane to a junction, wait safely in the junction until the through traffic has cleared, and then make the left turn with priority over vehicles now waiting to cross from the sides. Brilliant idea! Turning onto the Dover seafront on a cool Wednesday morning, Dave and I were hailed by a fellow CTC’er making his way to the port and so our little group of travellers started to come together for the trip. Ian Macsporran had been down at the port the evening before, scouting out suitable meet-up locations and had sent us some nice pictures of the Travel Centre, which is where we were headed when he caught up with us that morning. Not many minutes later, we were joined by Phil and Rowan and decided, since Alex had said he might be running a little later than us, to head through to the dockside for the boat. Rowan waiting for the ferry at Dover docks – and proudly displaying her boarding document. Note red line! 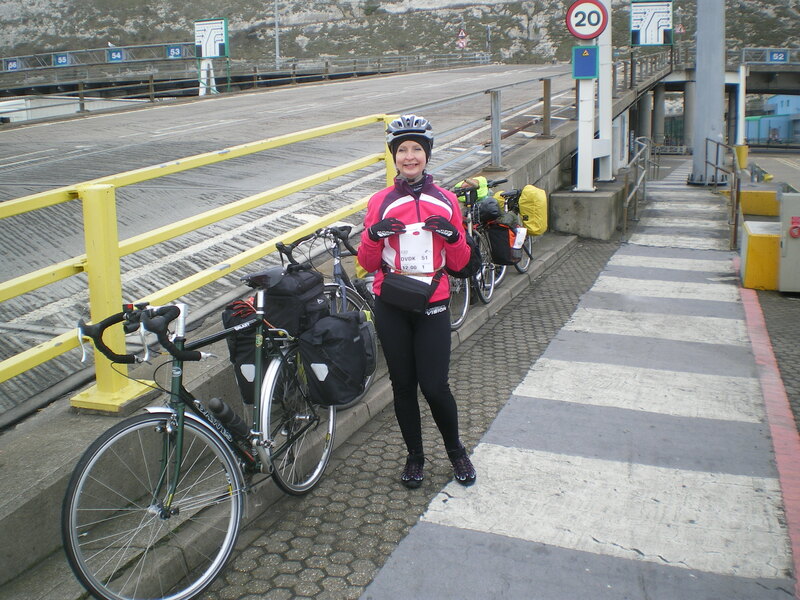 Thanks to the port of Dover having bought a big pot of red paint, getting to the boats is easy on a bicycle – you just follow the red line and stop everywhere you’re asked to. What you don’t do is leave your lock behind at the Travel Centre because getting out again is not so easy (no names!). Fortunately, a kindly motorist had seen it fall of one of the bikes and had brought it dockside with them. After being allowed to board, we stationed ourselves in the restaurant at the pointy end (one of the perks of getting on first) and Alex, having timed his arrival impeccably, appeared a few minutes before the off. Away to France! First off the boat in Dunkerque, we failed to capitalise on that by stopping to take a few photos and shed a few layers of clothing. The Channel may only be a few miles wide but it was about 15 degrees warmer the over other side than it was in Dover. 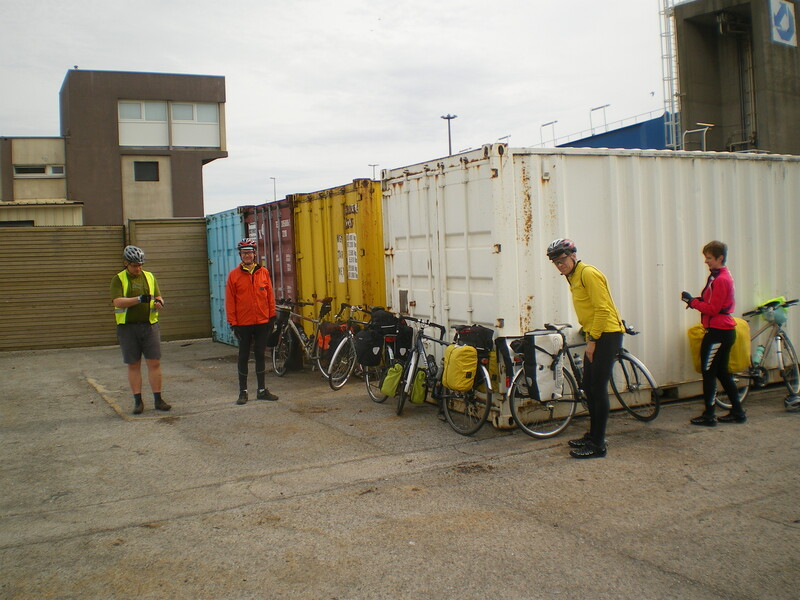 Narrowly avoiding a turn that would have drawn us up towards the Autoroute, we rolled through the industrial landscape between the port and Dunkerque town, stopping only to remove yet more clothing (did I mention it was warm? ), before hitting town roads. 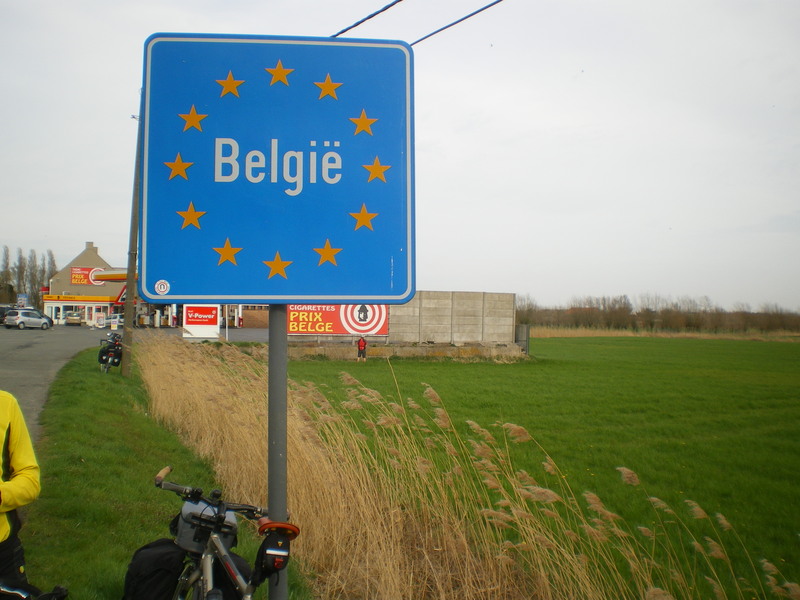 Google StreetView (other online mapping resources are available) had prepped me for the route and we made it through Dunkerque unscathed, and without getting lost, turned onto the road for Belgium and began to appreciate the combination of flat roads and tailwind. 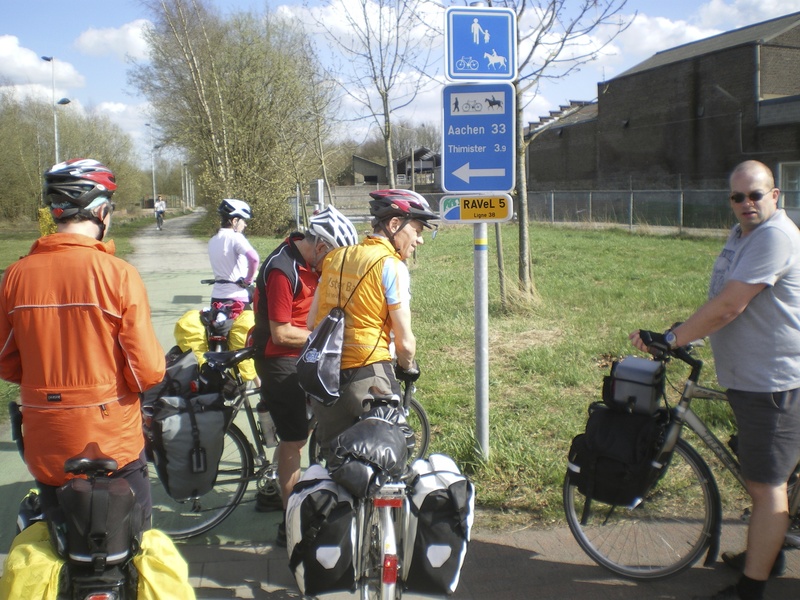 We thought France was cyclist-friendly, but it’s positively second division compared with Belgium. Separate, well-surfaced cycle tracks, priority lane around roundabouts and, when you must use the road, motorists drive like they don’t want to hit you! Of course, sometimes we had to slum it and use on-road cycle lanes (If only we had that sort of infrastructure and attitude here!). We switched from the original plan somewhere in De Panne. It was a nice day, the wind was being kind and the resort was lovely (we even saw a mum teaching her kid to ride his balance bike, in the middle of the town centre!) so instead of tracking inland, we followed the main cost road, alongside the trams, to Nieuwport. Yep, that’s right, we just followed the main road. Imagine that in Britain. 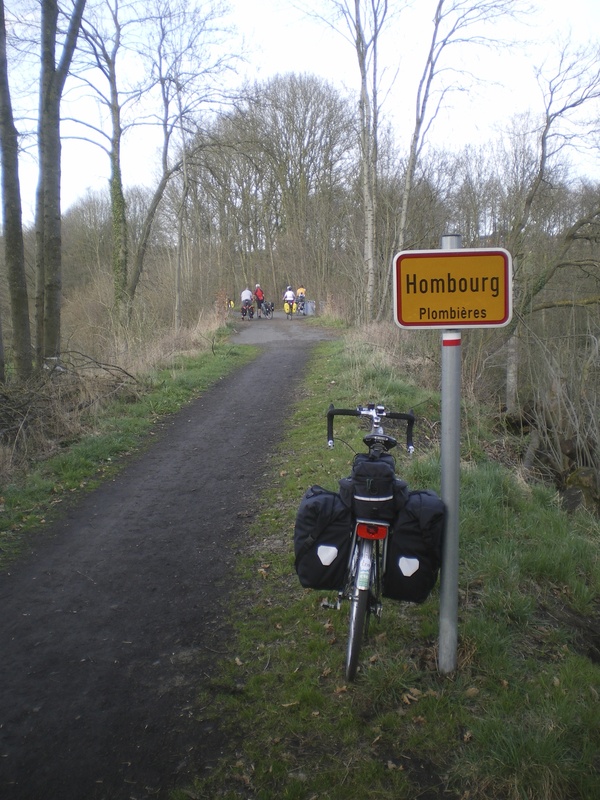 With a little assistance from Alex’s GPS, we snuck around the canal bridges in Nieuwport and struck out on the main road (again!) 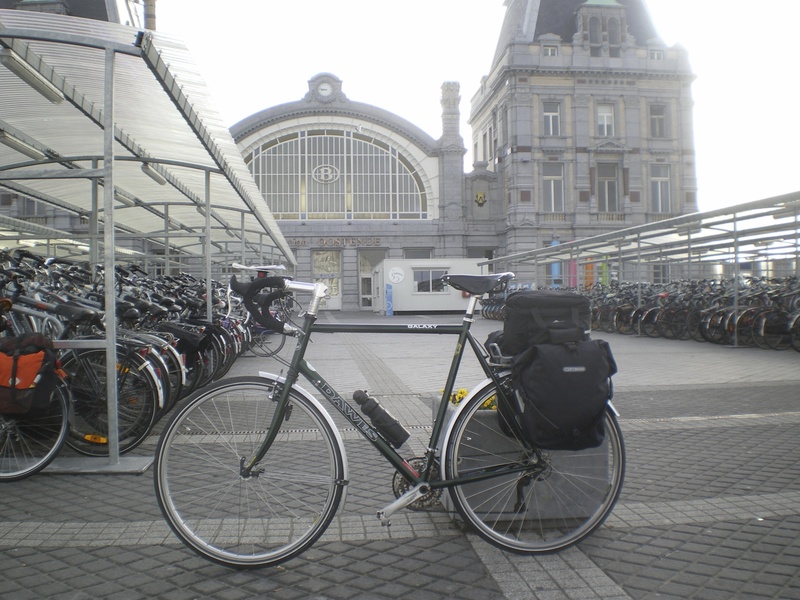 to Middelkerk and Oostende, rolling into town at 19:30. Ian and I were surprised to find that our hotel could not accommodate bikes because the lift was “too small”. 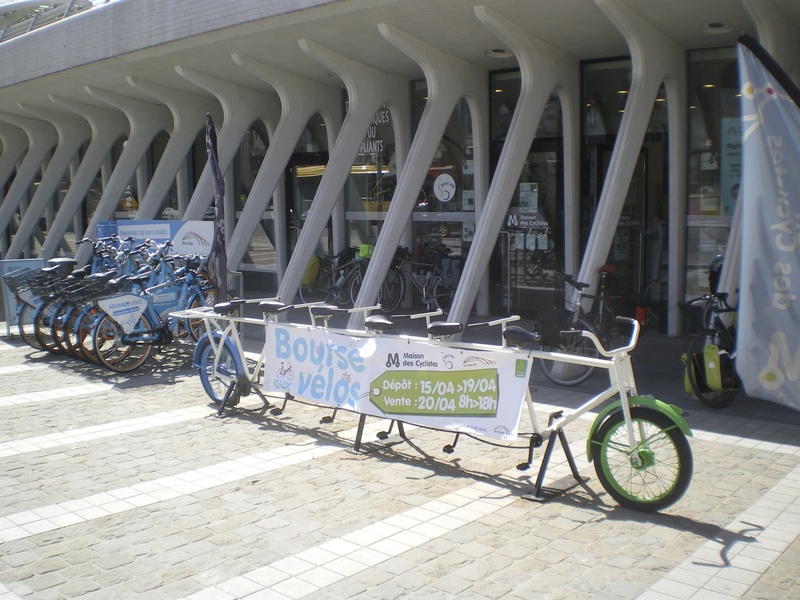 Obviously no-one in Belgium ever stands their bike on its tail! Fortunately, our room was on a separate floor to Reception so we didn’t have to wheel the bikes past the front desk. I think everyone managed something similar. Food-wise, we found a pizza parlour (okay, we hadn’t got into the local-food vibe by this point). 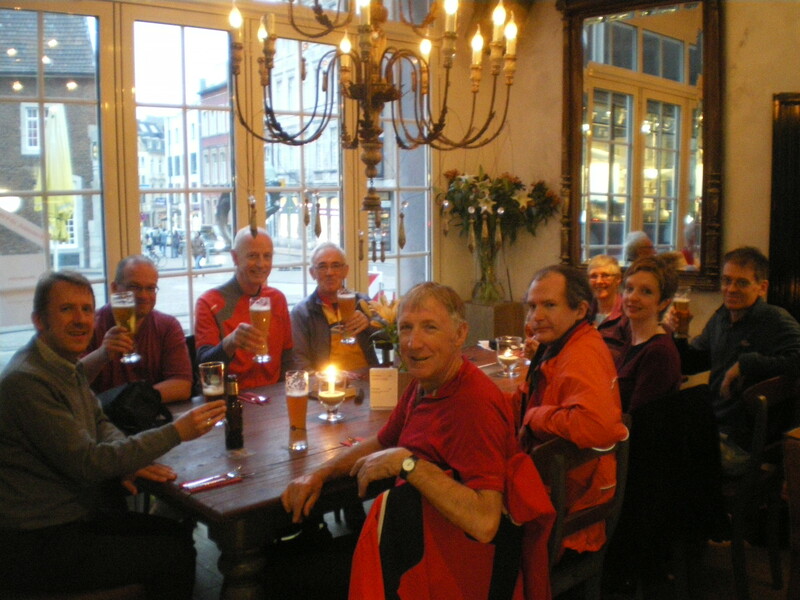 Drink-wise, we couldn’t help but find pubs (we definitely got the local-drink vibe) and so ended Day 1 of the rides to Aachen for six very happy cyclists. On Sunday morning (28th April) we meet at 9.30 a.m. outside Moulton Co-op for a short, leisurely ride suitable for all ages. We will pedal the bike paths of Moulton and then go under the Round Spinney roundabout. There are more bike paths through a quiet industrial estate before we cycle alongside the Billing Brook. Further paths take us past Lings Wood and Fox Covert Wood to a cycle bridge over Talavera Way. 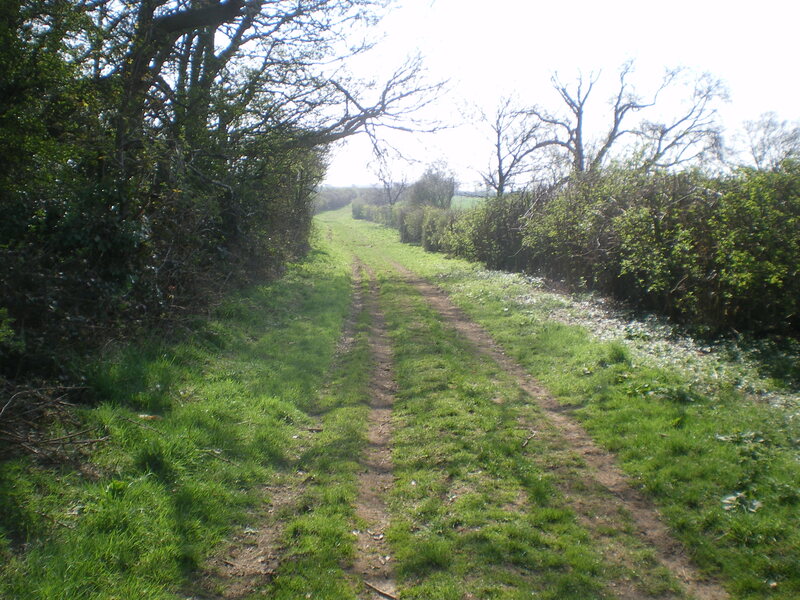 We pick up a byway which will take us out to Ecton Lane. We then descend to Sywell Country Park for a short break, after six miles. The Country Park has picnic tables and it’s possible to buy a drink and a snack if you don’t want to carry them from home. The toilets are fresh and clean, with hot water at the basins and warm-air hand dryers. We’ll then return to Moulton on quiet roads via Mears Ashby, Sywell and Overstone, giving us eleven miles in all. If we spend twenty to thirty minutes at the Country Park, then we’ll be back at Moulton by 11.30 a.m. I’m grateful to John Cutler for sharing the greater part of this route with me about three years ago. A map of the route is here. The byway is the only part of the route that is not well surfaced. There’s about 200 metres uphill on the byway and then 300 metres flat. It’s not muddy. If you wanted to push, it would be 500 metres at the most. I took these photos today – Thursday. 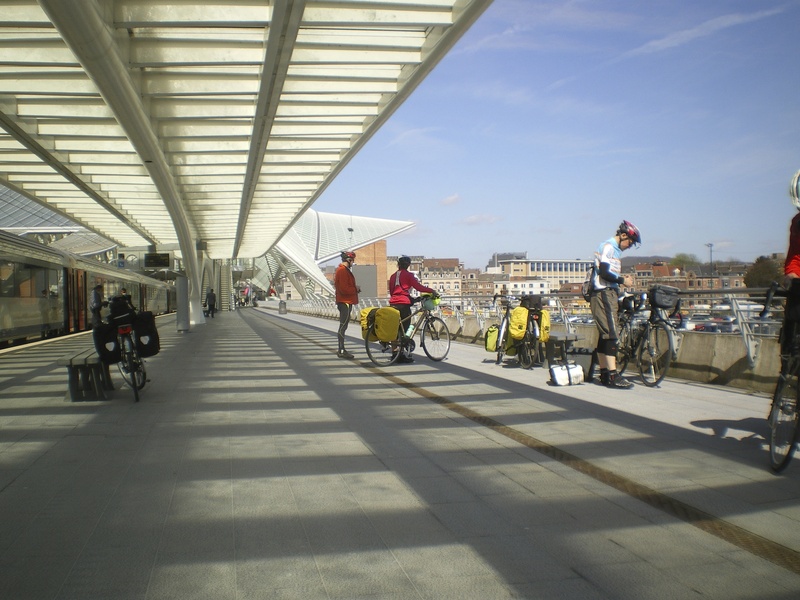 Come and join us for this ride – bring a friend or relative – explore some of the cycle paths and byways on our own doorsteps – and be home with an appetite for Sunday lunch! We start at 9.30 a.m. from the Brampton Valley Way (BVW), at the crossing of the A5199 near The Windhover, for a brisk ride of 35 miles. 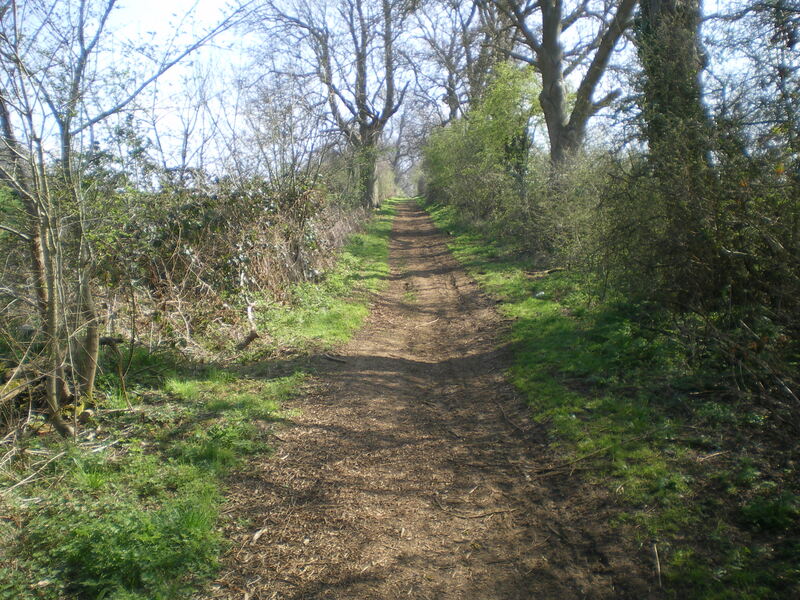 The route follows or shadows the Midshires Way – all of which is now on good road surfaces so off-road bikes are not required. We go out via the Bramptons, Nobottle, Flore, Gayton and Roade to Salcey Forest for a coffee stop after 25 miles. We return following the National Route 6 through Quinton, Great Houghton and Northampton to the BVW after 10 more miles. Phil is on 07867 388592. Seven riders met at Moulton Co-op for a ride to Braybrooke. Spring must have been in the air as two “best bikes” (Bianchis) were taken out of winter storage. The temperatures were not quite up to normal and there was still snow alongside some of the lanes, but it was sunny and dry. With a tail wind we set a brisk pace up through Old and Draughton and on to Braybrooke where we crossed the River Jordon before hitting the outskirts of Market Harborough. I’d forgotten just how long the hill up to East Farndon is and that both Clipston and Kelmash each sit on the top of their own hills. However, we made the Nagarjuna Buddhist Centre at Kelmarsh by 11.30am in good time for brunch, only to find at least four other cycling groups had the same idea. Brunch was only coffee and cake with few seats available and we departed for home after only a short stay. The ride back was into quite a cold breeze which showed that Spring has not yet sprung but it was still good cycling weather. We meet at 9.30 a.m. at Moulton Co-op for a ride of about 45 miles to Braybrooke and back. Our route goes via Holcot, Old, Draughton and Harrington to Braybrooke. We’ll come back via Market Harborough, Clipston, Kelmarsh (brunch), Naseby, Guilsborough and Brixworth. Quite hilly, all on mostly quiet roads. Could Sunday be the start of the Spring weather? With only one planned stop for sustenance at the Kelmarsh Naganjuna cafe, please bring a snack as a top up along the way. More information from Brian on 01604 622073 (or 07722 055149 on the day).